No quarterback in history can match a start quite like this. Alabama's Tua Tagovailoa entered Saturday's game at Arkansas on pace to shatter college football's single-season passer rating record, among other milestones, and serving as the catalyst for the top offense in the country at 54.2 points per game. Somehow, he is still improving. Tagovailoa just completed 10-of-13 passes for 334 yards and four touchdowns. His throws went for nearly 27 yards per attempt and almost one of every four of them found the endzone. The nation's best quarterback played like he came out with even more to prove. 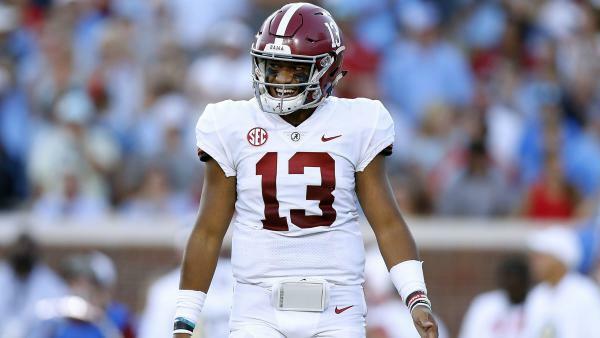 Tagovailoa's Crimson Tide won 65-31 and, fittingly, he connected with Irv Smith, Jr. for a 76-yard touchdown on the very first play from scrimmage. The updated stat line for Tagovailoa could not be more impressive: 76-of-101 passing (75.2%) for 1,495 yards, 18 touchdowns, zero interceptions, 14.8 yards per pass attempt. For good measure, he also has two rushing touchdowns on the year. Tagovailoa has still yet to play in a fourth quarter and understably so; Alabama is now averaging 39.7 points and 375.6 yards in the first half of games this fall. For Tagovailoa, his last two first two quarters have resulted in 18-of-20 passing for 462 yards and six scores. Tagovailoa attempted just one pass after the break in Fayetteville. Current SEC records for completion percentage, Kentucky's Tim Couch at 72.3%, and yards per attempt, LSU's Zach Mettenberger at 10.4, offer perspective. So does Tagovailoa's ball security; the league's six all-time Heisman Trophy-winning quarterbacks, Cam Newton, Johnny Manziel, Tim Tebow, Danny Wuerffel, Steve Spurrier and Pat Sullivan, combined to throw 56 interceptions in their famed seasons, with Tebow tossing the fewest at six. Tagovailoa, in addition to all of his highlights and production, has not thrown one pick. Against a conference foe in Arkansas, no less, Tagovailoa-led Alabama compiled 639 yards of total offense. The unit averaged a first down on every single snap. Notably, the Crimson Tide have now topped the 600-yard mark in consecutive outings. Alabama's worst offensive output halfway through the regular stands at 516 yards at Ole Miss, a game where the unit still averaged over 7.1 yards per play and the team scored 62 points. This is the first time in program history the Crimson Tide have had six straight 500-yard or 45-point efforts. Still having made just a half-dozen career starts, Tagovailoa has already added a dramatic new downfield element to the already-dominant defending national champions. He attacks opposing decisions with a precision and proficiency rarely before seen. The end result, for the Crimson Tide, might just be the SEC's best offense ever. Right now, 1996 Florida holds the single-season record with 46.6 points per game and 2012 Texas A&M has the total offense mark with 558.5 yards per game; Alabama currently averages 56 and 567.5, respectively. Last year's title game introduction aside, no quarterback in history can match a start quite like this. These are numbers the greatest program in the game has never before seen. Tagovailoa, not far removed from an iconic performance in the College Football Playoff Final, is on the verge of even more greatness. Well beyond just standing out, he may soon stand alone.